“I just wanted to tell you how much you inspired me that day in Arendal. I had never thought about loneliness or solitude that way. Thank you. I have started a popular movement called Skravlekopp. It’s a green cup with the word Skravlekopp written on it. If you choose that cup instead of the regular cup when you´re out having coffee, other people in the coffeehouse know that you are open to talk to others. If you are one who needs conversation or wants to offer it, it makes no difference. We just need a signal to let people know that we are open. What a beautiful, simple idea. Skravlekopp illustrates the very core of how I think we must re-invent the meaning of welfare. Skravlekopp is not a “service”: you can’t measure it and there are no outcomes. It is a simple idea woven into everyday life. Most importantly there is no boundary between those who need help and those who offer help: there is just an openness, a human recognition that we are all woven together and might need different things at different times. Many of the Experiments I describe in Radical Help share this principle: a lack of delineation between the helped and the helper. Circles for example –community support for a rich older life -have members, some of whom are offering “help” to others and some of whom need “help”, but who can say who is the helper and who is the helped or who gains most from each interaction. The boundaries shift over time and between encounters. I’m very honoured that a talk I gave almost two years ago that summer in Arendal could have sparked this idea although clearly it is Venke’s imagination and energy that have made this happen. That same talk was the start of something else too: in Oslo social workers have started a project called Oslo Life, building on the family experiment I describe in Radical Help. I will write more about this in another blog to follow. I am returning to Norway this week, where a new Institute is to be opened in Trondheim dedicated to the development of Relational Welfare. I’m honoured to have inspired this Institute with my writing and work. In Norway state welfare systems are well-funded and resourced. But just as in every other part of the world, there are many who are asking how well these systems are really supporting us in this century. There are those who worry that many languish over generations: their problems are managed but their lives never change. Others draw attention to the fate of people who have recently arrived in Norway and who don’t have the help they need to find new, thriving lives and to get to know others in their new home country. 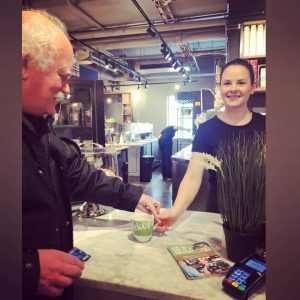 From loneliness, to health, to work and good family lives – in Norway many are seeking for a new way forward – one based in deep human connection as opposed to efficient industrial transaction. The open, light touch and very human connection that defines Skravlekopp is like a beacon lighting the way.